T-Mobile’s got some network news to share. 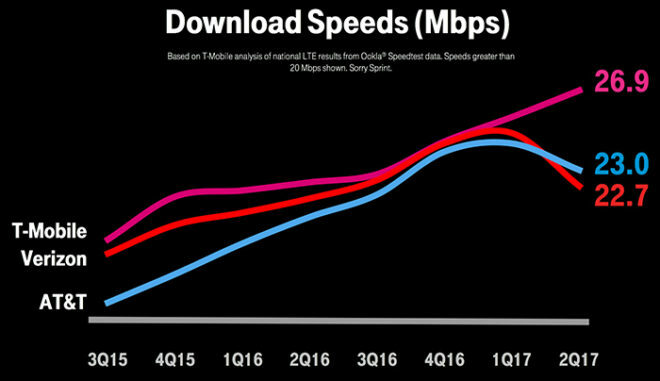 T-Mo says that, according to its analysis of national LTE results of Ookla Speedtest data, it’s got the fastest download speeds in the U.S. T-Mobile had an average of 26.9Mbps, while AT&T had 23.0Mbps and Verizon had 22.7Mbps. Sprint finished below 20Mbps, and so T-Mo decided to not include it in its graph. Also included in today’s announcement is that, according to crowd-sourced data, T-Mobile’s LTE availability is at 91.5 percent. Verizon was at 90.2 percent and AT&T was at 83.4 percent. 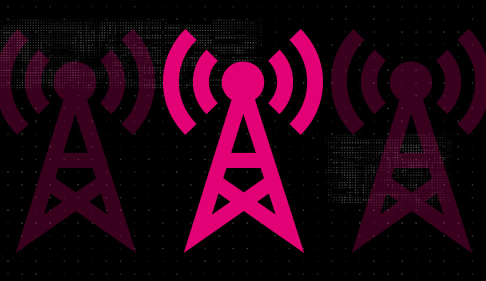 This means that T-Mobile customers get an LTE signal 91.5 percent of the time. Looking ahead, T-Mobile says it’s still planning on beginning its rollout of 600MHz spectrum that it acquired from the recent FCC auction. T-Mo hasn’t said where we’ll see 600MHz airwaves lit up first. Also notable is that there will be phones from Samsung and LG that support 600MHz available in Q4 2017. The specific models that Samsung and LG will have on offer haven’t been revealed, but it’s good that T-Mo will have 600MHz-compatible devices to go along with the rollout of its new 600MHz coverage. When 600MHz-compatible phones start arriving later this year, are you going to consider upgrading to one? Wonder if the Pixel 2 will support this. Probably. Just like the V30. I feel you. I told myself that I’m happy with the S8 so there is no need for the note 8. However, every new leak that comes out is inching me closer to changing my mind. I’m assuming this years iPhone 8 won’t support it. You’re making the basis of this assumption because Apple hasn’t said anything about the phone yet? The Tomato and Orange said so as Apple gets all the attention. I know I said I was going to stop posting here but I can’t resist. The amount of BS T-Mobile claims is hilarious. I’d love to know what areas this testing was done in to claim T-Mobile has more LTE Availability than both Verizon and AT&T. They must have only tested in a few major cities. Talk about the most biased study I’ve ever seen. What a joke! It is also laughable that T-Mobile wants to brag about their study giving them a measly 4.2Mb/sec lead over Verizon and claiming Verizon’s network can’t handle Unlimited. Neville Ray must overlook the fact that Verizon has MORE THAN DOUBLE the amount of customers than T-Mobile. If T-Mobile had 146M customers, their network would collapse upon itself. When I was a T-Mobile customer, the last year I was with them, I saw the worst of network congestion since they gained so many customers and their network couldn’t keep up with it in crowded areas. Just the other day, with my Verizon Google Pixel and my girlfriend’s T-Mobile Nexus 6P, we compared speedtests at my Apt. in Bensalem, PA just to see if T-Mobile was getting better. Both of us had a moderate LTE signal of -108 dBm. Verizon – 10Mb/sec, T-Mobile 0.3Mb/sec. I understand this is only one location, but it is the one that matters, and the situation is extremely rarely the opposite. Bottom line is, T-Mobile needs to stop tooting their own horn like a kid with low self esteem trying to prove them self that they are the best, because they are not. Until they can at least tie with Verizon on rootmetrics ON A NATIONAL SCALE, they need to stop with the lies! I agree on the network congestion, when I’m in a crowded area even with 4 bars LTE I still can’t even browse the web. Feels like dial up speeds even with LTE shown. Yep, that is how it was roughly 60% of the time when I was in the most populated parts of Trenton, NJ and Philadelphia, PA on any normal work weekday. With Verizon, I can only recall 1 time I had very slow LTE speeds. New Years Eve at Penns Landing in Philly, where there might have been about 10,000 people on a single tower. Other than that, I do not have any of the issues I had when I had T-Mobile. Just yesterday, I was at a brunch on the lower level of Estia’s resturant on Locust St in Phily. T-Mobile and AT&T people had no signal at all, and my Verizon had a weak but USABLE 3G signal. What TMO phone are you using? When I was with them, I had a Galaxy Note 5 which has Band 12 support as well as LTE Advanced 3-Way Carrier Aggregation. In perfect conditions it would pull over 100Mb/sec. It was definitely not the phone, trust me. I had that phone in Canada last summer and it did about 150Mb/sec there. Unless the roll out 600 mhz everywhere it doesn’t matter what phones has the ability as T-Mobile seems to only focus on the large cities. I just switched to T-Mobile in February/April and I don’t know if I’m going to stay. The price is good, $80 for 3 unlimited data lines, but coverage in the small city and surrounding areas I live is spotty and data speeds barely crack 20 mbps. I was on Verizon but I don’t know what they’ve done around here but with my Google Pixel phone I got horrible Verizon reception. About -20 dbm worse that my Nexus 5X or any other phone I had on Verizon. I would just stay with T-Mobile and lock in that plan for the foreseeable future. Everything points to more price increases as the network expands. T-Mobile has committed to matching and even surpassing Verizon in square miles of LTE. Not to say people are skeptical of this, but they have the spectrum and investments necessary to make it happen. Their progress has been amazing the last few years. Hope to see it continue. Exactly. Lock it in. I’ve taken advantage of some past promos and I have six lines at $169 a month including taxes. Right now it’s unlimited until Feb 2019, and after that it’s 10GB on each line. I started with four lines on the 2.5GB plan and T-Mo has continued to upsell me. I locked in when the service wasn’t quite as good and everyone is really happy now. I hope they offer some deal in 2019 when everyone gets off that promo three-year unlimited. If they offer a sweet enough deal earlier, I might jump on it. What can’t you do with 20 mbps? Also, small towns are dying. You don’t understand what “availability” means. Verizon has many more rural customers than Tmo does. Most Tmo customer are urbanites. I for one have Tmo LTE available 100% of the time because I don’t travel to Wyoming or Nevada. Verizon customers travel rural and they think Verizon is better there, yet their phone’s connection drags down the “LTE Availability” scores cause Verizon doesn’t cover the whole USA with LTE. They may have 1X or 4G, but not LTE. I roadtrip with Verizon friends and my Tmo keeps up, for less. Of course I know what “availability” means. It means what percent of the time the phone holds an LTE signal. I could run a study in any major city with all 4 carriers and be on LTE 100% of the time. The breaking point for me was when I went on a road trip through Vermont, New Hampshire, and Maine. I was constantly roaming on AT&T/US Cellular and the few times I did have LTE, it was low signal and unreliable, and would constantly drop to HSPA or EDGE. Google Maps ended up eating up the 50MB of roaming data T-Mobile gives you, which may I add is throttled to around 64Kb/sec. I was done after that trip. LTE availability during that trip was roughly 25%. Tmobile gives you 200mb of roaming data if you’re on the 1 plan. Sounds like you do a lot of travel in rural areas. Tmobile is not for you and never will be lol. You get what you pay for! “You get what you pay for” doesn’t seem to mean much anymore to T-Mobile considering they raised their unthrottled Unlimited to match Verizon’s price. I give T-Mobile total credit for forcing Verizon’s hand to offer unlimited again, so I give them that, but big deal, so you save a few bucks in taxes on T-Mobile. Wait and see, as T-Mobile gets closer to Verizon’s coverage, they’ll raise prices even more. I’d wouldn’t surprised if things flipped and Verizon started pulling un-carrier moves in the near future. Bottom line: Competition is great for the consumer! They gotta pay for the 600mhz spectrum somehow! Sweet, I want to do that too but I’m going to wait to see how much the note 8 will be. I don’t see myself leaving T-Mobile in the near feature and I like Samsung galaxy and Note series and eventually a iPhone here and there . so instead of buying two to three phones every year why not just go with JOD . Get this! i was recently in an area called greenville CA for work, verizon coverage CLAIMED LTE but when i got there the whole city was 1X and roaming. Tmobile claimed LTE and based on OpenSignal and sensorly there was verified LTE coverage in greenville…. Tmobile did have verizon beat in coverage in that area. That is pure anecdotal. In my area, decidedly urban, verizon doesn’t have signals in most parking decks, even at the ground level. AT&T traverses 1 1/2 levels below ground ! T-mobile as bad as verizon. Outside the deck, all have good coverage. Please give me a list of these so called “every other area throughout USA”. I must have had some really bad luck with some of the places I went where T-Mobile was struggled with either signal or data speeds. The bottom line is, T-Mobile for me was just unreliable. It would work amazing one minute, and time out another minute, then work great again. T-Mobile might have blazing fast speeds here and there, but they have no consistency on the grand scheme of things. Believe me T-Mobile-MetroPCS is very consistent in the areas that I’ve mentioned to you about a few minutes ago there Buddy. You lied and said that you were going to leave us all alone on this website here. Be gone about your business. Well you are talking about you. Right?? Sooo how about you stop lying about how T-Mobile-MetroPCS is the worse carrier throughout all of United States of America. i agree he should just leave, he said he was so i dont get it why he still here? verizon works for him we all know that. tmobile works for us were we are at. Verizon didnt work in my area of los angeles ,tmobile does plain and simple , and like someone else said that he doesnt travel to wyoming or the middle of nowhere, me too and i never will im always in the city. so im good with tmobile. What band will it be? Once i get my new tmobile iPhone 8, im going to compare coverage again my current unlocked iPhone 6s plus. driving around looking for a signal is an incorrect way of measuring coverage. If your phone is many miles from a tower, you may still see a signal with low frequency spectrum but you cannot connect because your phone doesn’t have enough power to transmit back to tower. That happens a LOT with verizon in rural areas- signals are NO guarantee of actual usable coverage. Then how else am i able to compare coverage? How would that be incorrect? Just looking for a signal alone wouldn’t 100% mean your phone will work but, running speed tests or trying to make calls while passing those areas would show if there is coverage. Well I don’t know about Ohio but everywhere I go in Illinois and Wisconsin, if there is Verizon or AT&T, I’ve had T-mobile in the same spots and at higher signal strength/speeds.. Except one very little spot I stay at in the middle of no where Wisconsin. Where Verizon has Voice coverage only, no data and its like 1 bar of service. There is US Cellular in the area but that’s a whole different story. If i go towards the town itself, within a couple miles I have coverage again. With-in the next few years with its 600mhz T-mobile will have caught up to all the same areas. So the Note and V series. Was to be expected. Only IF I can find one for less that $300. Using a 2+ year old Moto Nexus 6 at the moment. Is 600MHz different from LTE-U? Sounds like I’ll need both. I’m on a Note 5 (just bought a sealed demo unit when I broke my last one), and everyone else on my plan (five other lines) just picked up new G5 Plus’. I’m done paying for flagship phones, but I definitely want the new band. LTE-U basically uses a band FCC called ISM. (Industrial, scientific, medical) frequencies. That means end-users don’t need to apply for a license to use this band. Many products use this band- home phones, WiFi, wireless security cameras, and home security systems to name a few. So, originally, this band was specifically created by the FCC for “use other than telecommunications” and didn’t carry a licensing requirement. Because of its broad use, including in medical, (where FDA has oversight) there have been several proposals to limit ISM use to its original intent, and not open the band up for “telecommunication use”. It’s highly likely that the FCC will not approve LTE-U for commercial purposes. At a recent legal conference, a speaker whom ran the FCC’s Office of Engineering for 30+ years stated that ISM should remain non-commercial in nature, so it’ll be interesting to see if anyone outside of T-Mobile adopts the technology. Verizon and AT&T Regulatory were on that panel and that’s likely why Verizon and AT&T have decided to backpeddle, and wait before adopting the technology. John Hunter at T-Mobile was in the lobby and missed that part of the conference. T-Mobile has WiFi calling and also won a good amount of low band 600Mhz so it’s probably best to consider those bands. The upcoming CBRS auction will be limited to 250mw of power on the phone so that pales to 600/700Mhz which, depending on licenses and other factors can transmit at a little over one watt. See above once my link gets approved as it relates to his disinformation. Cliftons info is 100% bogus. I thought FCC already approved it for telecom use? And Verizon already stated they will be deploying as well…they actually stood with T-Mobile to lobby for it. so it’ll be interesting to see if anyone outside of T-Mobile adopts the technology. Verizon and AT&T Regulatory were on that panel and that’s likely why Verizon and AT&T have decided to backpeddle, and wait before adopting the technology. Oddly enough, T-Mobile and Verizon are both moving forward with LTE-U while it is AT&T alone that is preferring LAA and forgoing LTE-U. Wait, really? I had to think about this briefly. Because LTE-U is live, as of 06/26/2017, in “Bellevue, WA; Brooklyn, NY; Dearborn, MI; Las Vegas, NV; Richardson, TX; and Simi Valley, CA, with more rolling out later this year” according to T-Mobile. Your best bet for using on t-mobile is the motorola g5 plus. It is available on bh photovideo currently for $229. It has all the bands in use in US and some international (for travel roaming) and it is certified for VoLTE on t-mobile. IMO, best phone for any US carrier if you are looking for price vs features. It does not include band 71 but my guess is next version of it will. Sure would be nice if 3xCA was more WIDELY deployed here in Houston!!! I love how I’m labeled as a Troll because I no longer drink the T-Mobile kool-aid. I never said T-Mobile is a bad service, they are just inconsistent. I am pretty sure T-Mobile will keep improving but it’s too little too late. I don’t want to wait until 2020 to have a fully reliable service that will work everywhere I go. That being said, I am still rooting for T-Mobile to keep getting better. I just don’t like all this bragging before the fact and bragging about the results of heavily biased and inconclusive studies. I am extremely grateful for all John Legere has done for the Mobile Industry as a whole. If he didn’t shake things up, Verizon and AT&T would still be without Unlimited Data and have higher prices. I completely understand T-Mobile is exceptionally great for most, but not for others. I want to give out a warning though. If and when the day comes that T-Mobile becomes as big as Verizon and AT&T, there WILL be a “Triopoly” and you will see higher prices across the board. Too little too late for you…good for you that you found your happiness but why do you come here to s**t all over ours? You’re a lonely little troll…you look like one, smell like one and talk like one. You’re crap opinions are not wanted nor needed here! lol wow somebody is angry. Grow up, kiddo. Just because somebody doesn’t agree with you, doesn’t make them a troll. The name calling is very mature by the way. Get over yourself. Are you done with your childish insults? Lol nah man I know Verizon still has the edge in rural areas. I just hate it when trolls consistently try and grab attention…and never bring anything of substance to the table. Dude constantly says he’s done with this site and he comes back every time and pukes out the same song…most of it completely inaccurate and ignorant then cries when he gets insulted. I don’t cry, I respond with fact.Besides rural areas, Verizon actually has the edge for me in a couple metro areas, more specifically Trenton, NJ and Philadelphia, PA. More times than I can count on T-Mobile, there would be instances where I’d have extremely slow speeds despite having a strong LTE signal with T-Mobile, even with Samsung Service mode showing me on 20×20 Band 4 + 5×5 Band 12 with a -75dBm signal. In those same cities, Verizon works great every time. Consistency and Reliability far outweigh maximum speeds. I rather get a steady 4 – 16MBit/sec than 100MBit/sec here, and 0.01MBit/sec there. I’ve always had consistent speeds in the same spot of 100mbps to 120 mbps something speeds Bro. your time is up. Stop stating false facts. Whose pretending? Nobody is pretending here. Whose asking you to talk to me?? Nobody. I ain’t pretending to know anything at all or pretending actual facts. You don’t even know me to start with. I advise that you go drink some more sand and choke on that sand there buddy. AT&T/Verizon won’t ever stand a chance for Better accuracy with T-Mobile-MetroPCS Nation. Keep my name right out of your mouth Dude. Yes I will say it again T-Mobile-MetroPCS will forever be way Better than bummy AT&T/Verizon. I had AT&T/Verizon and let me tell you this much, their so called excellent coverage is not always accurate with actual signal strength/LTE stable reliability. AT&T/Verizon LTE could remain, but does not necessarily mean that you will remain on stable internet/data access. I never once had an issues with having Strong LTE Data strength with T-Mobile-MetroPCS you idiot. Leave me alone. You are a fool for agreeing. You actually don’t agree. You are just desperate for friend. Boy Bye. I’m sure that these phones will have all other bands besides AWS and band 71 disabled to “discourage” people leaving, even after paying full price for these phones, gullible customers get castrated phones. The S8/S8+ can do all of this now right? No the galaxy s8 cannot use the 600mhz signal. So what is it, S8 can or can not?? the s8 has the 600mhz band however has not been enabled. The new tower’s are being tested, only until then it’ll be enabled from an update. Hop this helps. Link that proves the S8 has 600mhz built into it? False. There is no hardware support for the 600 mHz band in any S8 units. Qualcomm has said they will modify the Snapdragon 835 to support the band, but that has no effect on devices that have already shipped like the Galaxy S8 and OnePlus 5. As of right now, no phone in any market in the world has support for the band. well at least one phone does, because T-Mobile is testing 600Mhz with a phone that they have blurred out so we can’t tell what it is, but they have one and working…. so just to be fair, there is at least one. Yes! Support for Samsung galaxy s8 plus is better. Speeds greater than 20 Mbps shown. Sorry Sprint. Only those exceeding 84% anytime in 2017 represented. Sorry Sprint. This suggests that Sprint’s LTE availability has increased. in my area Sprint is by far the fastest available…… however, it is VERY spotty. I was working with a customer who had a sprint phone and asked if we could run a speed test just because I was curious and it got 60Mbps…. i was in shock, ran it multiple times. the fastest I have ever seen here on T-mobile was just below 30Mbps but that is not normal. normally my area is like 10 or less on T-mobile. But still I have AT&T built into my truck and and AT&T phone for work and it ranges from 5 to 20 Mbps. but the guy did inform me that his phone drops all the time around here and is not very stable. When there’s an IP68/810G phone that supports 600MHz data and Sailfish OS, I want to own it. Considering how things look right now, it’ll probably be a Sony.